The poems in Without Angels watch the world for evidence that the angelic orders—once positioned just above humankind in the Great Chain of Being—maintain a presence among us still. Angels move through these poems in both ancient and contemporary dress, some attested to by witnesses who offer a halting testimony, some speaking for themselves, others woven so subtly into the fabric of the world as to go unnoticed. In Part II, specific angels pursue specific missions: an angel delivers a message to Lot or conducts the corpse of Adam to a final rest; a guardian angel out of childhood’s lost faith intervenes to prevent a suicide; art historical angels appear in paintings and sculpture gardens. Recent incarnations, too, are represented: flight attendant angels, angel fish, angels of the missing outside the funeral home. In one poem, all that remains of the angels are cocoons left hanging in the branches of trees. Even in a poem filled with our culture’s substitutes for the angels—light houses, sonar, satellites—wing-shaped stanzas suggest the angels have not left us entirely on our own. Perhaps if we kept a closer watch? Spade-foot toads, after all, are everywhere hidden on the floor of Death Valley. If toads, then angels? Perhaps not. But mightn’t it be best to tread softly, aware “of what a mis-step among them might cost us”? Marjorie Stelmach’s Without Angels is extraordinary. Original. Her metaphysical imagination stirs and inspires. She combines physics and theology in ways that make sense within both frames of reference. Her lines are beautiful visually and aurally. I am stunned. This is a book to read and read again, then again. She deserves prizes. All the prizes. I have no words adequate to my astonishment at the poetry of Marjorie Stelmach, and wonder (not for the first time) why our finest poets are not always the best known. Hers is a wisdom scripture for the 21st Century, a ravishing glimpse of our better angels as they depart, a brilliance of language that makes even the gathering dust of our days incandescent. we left in the first place. 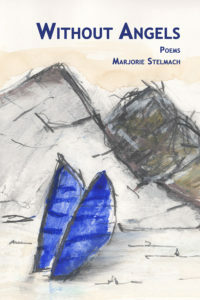 Marjorie Stelmach is the author of three previous volumes of poems: Night Drawings (awarded the 1994 Marianne Moore Prize), A History of Disappearance, and Bent upon Light (University of Tampa Press). Groups of her poems received the first Missouri Biennial Award and the first Chelsea Award; her awards include the Malahat Review Long Poem Contest and the Stanley Hanks Memorial Prize. A high school English teacher for 30 years, she has also served as visiting poet at the University of Missouri, St. Louis, and, most recently, as the director of the Howard Nemerov Writing Scholars Program at Washington University. Recent work has appeared in The Baltimore Review, Boulevard, The Cincinnati Review, Image, Kenyon Review Online, Prairie Schooner, River Styx, & Tampa Review.